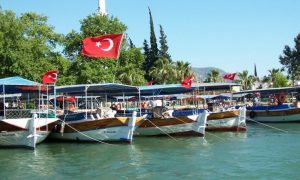 Arrive Dalyan Information - Dalyan - Travellers guide - Hotels, Real Estate, Shopping, Caretta Turtles, Dalyan Beach, Dalyan Delta and more..
Turkish Airlines (THY): THY has regular flights in Boeing 737-400’s, 737-500’s, RJ-100’s, and Airbus 310-200’s, 310-300’s, and 340-300’s for Ankara, İstanbul, İzmir, Antalya, Adana, Trabzon and Dalaman from major cities of the world. International airlines: Most international airlines have regular flights from all major cities of the world to Turkey’s international airports. Information and Reservations: For more information contact Turkish Airlines (THY) offices. Passenger Ferries: Apart from numerous cruises in the Mediterranean, several foreign shipping companies have regular services to the ports of Trabzon, Samsun, İstanbul, Dikili, İzmir, Çeşme, Kuşadası, Bodrum, Marmaris, Antalya, Alanya, Mersin and İskenderun. Car Ferries: There are several car ferries for tourists who wish to take their cars while sightseeing: Venice, Ancona, Brindisi, Bari, İstanbul, İzmir, Ceşme, Kuşadası, Marmaris, Antalya. Train journeys can be made to İstanbul directly from and via some of the major cities Europe. Private car: London – İstanbul, approximately 3,000 km. Germany, Argentina, Australia, Bahamas, Bahrain, Barbados, Belize, United Arab Emirates, Denmark, Morocco, Fiji, Finland, France, Granada, Iran, Switzerland, Iceland, Jamaica, Japan, Canada, Qatar, Kenya, Kuwait, Turkish Republic of Northern Cyprus, Liechtenstein, Luxembourg, Malaysia, Malta, Mauritius, Monaco, Norway, Oman, St. Lucia, San Marino, Seychelles, Singapore, Saudi Arabia, Chile, Trinidad, Tobago, Tunisia, Vatican City, New Zealand, Greece, Ecuador, Sweden, Israel, South Korea, Uruguay. The Republic of Croatia, The Republic of Slovenia, Bosnia-Herzegovina, Rumania, Macedonia, Indonesia. Bolivia, Kazakstan, Kyrgyzstan, The Republic of South Africa. For the countries mentioned above and Bulgaria, a transit visa is not required. U.S.A., Austria, United Kingdom, Ireland, Spain, Italy, Belgium, Holland, and Portugal can obtain a sticker visa at border gates (Up to 3 Months). Azerbaijan, White Russia, Armenia, Moldavia, Uzbekistan, Russia, Tadzhikistan Ukraine, Hungary, Poland, The Czech Republic, Slovakia, Lithuania, Latvia, Estonia, Georgia, the Federal Republic of Yugoslavia and Taiwan can obtain a sticker visa at border gates (Up to 1 Month). Nationals of Guatemala can obtain a visa for up to 15 days at border gates. Nationals of Jordan, up to 30 days. Nationals of all other countries require a visa, which can be obtained from the nearest Turkish embassy or consulate. Note: Citizens of Germany, Belgium, France, The Netherlands, Luxembourg, Spain, Italy, Malta, Switzerland, and Greece may enter Turkey with the proper identity cards in lieu of a passport. Limits: There is no limit on the amount of foreign currency that may be brought into Turkey, but not more than 5 5,000 worth of Turkish currency may be brought into or taken out of the country. personal effects of the tourist. one TV, one colour pocket TV (maximum 16 cm screen), one TV-tape-radio combination, one video recording camera and 5 video cassettes (blank); 5 records, 5 tape cassettes or compact discs. one video player, cine-projector (8 mm) and 10 rolls of film (blank), one slide projector. one pocket computer (maximum main memory capacity Ram 128k. Byte), electronic playing devices (without cassette – keyboard). one transistor radio and portable radio – tape player (its specification to be determined by the Ministry of Finance and Customs), one Walkman or pocket tape recorder, one portable compact disc player. harmonica, mandolin, flageole, flute, guitar, and accordion (only one of each type, maximum 3 musical instruments). 1.5kg. coffee, 1.5kg. instant coffee, 500 grams of tea. 1 kilo chocolate and 1 kilo sweets. 5 (100 cc) or 7 (70 cc) bottles of wines and/or spirits. five bottles of perfume (120 ml max. each). one camera with 5 rolls of film. First aid, and spare parts for the car. Other items necessary during the journey. Valuable items and all items with a value of over $ 15,000 must be registered in the owner’s passport upon entering Turkey, for control upon exit. Antiques brought into the country must be registered in the owner’s passport to avoid difficulties on exit. Sharp instruments (including camping knives) and weapons may not be brought into the country without special permission. Gifts, not exceeding 500 DM in value and not for trading purposes, may be brought into the country duty free. In addition, gifts not exceeding 500 OM in value may be posted to Turkey duty free, if the date stamped by the sending post office falls one month before, or one month after the following holidays: Şeker Bayramı, Kurban Bayramı, Christmas, and New Year’s. Note: Cellular Telephones entering the country must be accompanied by a certification form showing ownership. Ownership must be documented in the passport of the owner and will be checked on entry and exit. For more information contact the Ministry of Transportation, General Directorate at Tel: (312) 212 35 72 – 212 60 10 (10 lines), Fax: (312) 221 32 26 or write to Ulaştırma Bakanlığı Telsiz Gn. Md. Emek – Ankara. Gifts and souvenirs: for a new carpet, a proof of purchase; for old items, a certificate from a directorate of a museum is necessary. Exporting antiques from Turkey is forbidden. Valuable personal items can only be taken out of the country providing they have been registered in the owner’s passport upon entry, or providing they can show they have been purchased with legally exchanged currency. You Can Receive a Tax Refind for the Goods You Purchased In Turkey! Refunds will be made to travellers who do not reside in Turkey. All goods (including food and drinks) are included in the refunds with the exclusion of services rendered. The minimum amount of purchase that qualifies for refund is 5.000.000 TL. Retailers that qualify for tax refunds must be “authorised for refund.” These retailers must display a permit received from their respective tax office. The retailer will make four copies of the receipt for your refund, three of which will be received by the purchaser. If photocopies of the receipt are received the retailer must sign and stamp the copies to validate them. If you prefer the refund to be made by check, a Tax-free Shopping Check for the amount to be refunded to the customer must be given along with the receipt. For the purchaser to benefit from this exemption he must leave the country within three months with the goods purchased showing them to Turkish customs officials along with the appropriate receipts and! or check. If the retailer gives you a check it can he cashed at a bank in the customs area at the airport. If it is not possible to cash the check upon departure or if you do not wish to cash it then, .e customer must, within one month, send a copy of the receipt showing that the goods have left the country to the retailer who will, within ten days upon receiving the receipt, send a bank transfer to the purchaser’s hank or address. If the certified receipt and check are brought back to the retailer on a subsequent visit thin one-month of the date of customs certification, the refund can be made directly to the purchaser. The refund may be made by the organisation of those companies that are authorised to make tax refunds. A ‘Certificate of Origin’ giving the health record of the animal. A ‘Certificate of Health’, issued not more than 15 days before the animal’s entry into the country, stating that the animal is in good health and that it has been vaccinated against rabies. Car license (document where all details related to the car and the owner’s name are registered). If it is somebody else’s vehicle a power of attorney should be provided. International green card (Insurance card). The TR sign should be visible. Transit book “Carnet de passage” (for those who want to proceed to the Middle East). The General Directorate of Customs (Gümrükler Genel Müdürlüğü), Ulus Ankara Tel (312) 310 38 80,310 38 18, Fax (312) 31113 46, before the end of the period declared. In Case of Accident: The accident should be reported to the police or gendarme. That report has to be certified by the nearest local authority. The owner should apply to the customs authority with his passport and report. Upon arriving in Turkish waters, yachts should immediately go for control of the ship to the nearest port of entry which are as follows: İskenderun, Botaş (Adana), Mersin, Taşucu, Anamur, Alanya, Antalya, Kemer, Finike, Kaş, Fethiye, Marmaris, Datça, Bodrum, Güllük Didim, Kuşadası, Çeşme, İzmir, Dikili, Ayvalık, Akçay, Çanakkale, Bandırma, Tekirdağ, İstanbul, Zonguldak, Sinop, Samsun, Ordu, Giresun, Trabzon, Rize, Hopa. The airports of Ankara, Adana, İstanbul, İzmir, Antalya, Trabzon and Dalaman have ties for private planes. It is also possible to hire planes and helicopters in Turkey. The Civil Aviation Department of the Ministry of Transport (Ulaştırma Bakanlığı, Havacılık Gen. Müd.). Bosna-Hersek Cad., No: 5 – 06338 – Emek, Ankara. Tel: (312) 212 67 30, Fax: (312) 212 46 84, TIx : 44659 Ga-tr.